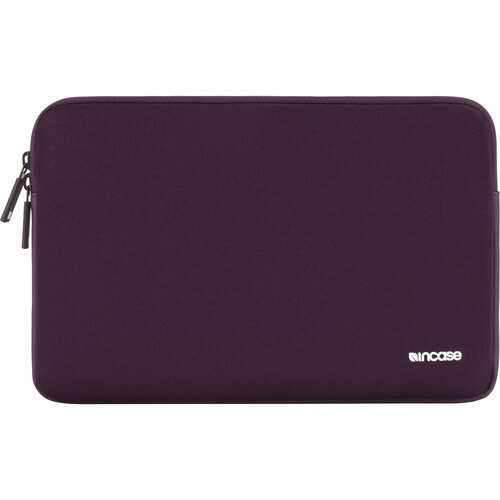 The Incase Classic Sleeve for 13" MacBook Air/Pro/Pro Retina features a nylon exterior combined with a cushioned interior made from 3mm of Ariaprene. The interior is also lined with a plush, faux fur fabric. Altogether, these materials combine to help to protect your notebook from everyday bumps and bruises. The sleeve has a zippered closure that extends a little bit down each side. This is done in order to help make it easier to slide your MacBook in and out of the sleeve. The zipper features YKK zipper pulls and a closed-seam construction that's meant to increase the durability and longevity of the Classic Sleeve. Box Dimensions (LxWxH) 14.5 x 12.1 x 1.0"